Just because Dr. Drew is a physician doesn’t mean he’s not a typical guy! During his visit to “The Real,” the "Dr. Drew On Call" star reveals why he dislikes going for annual checkups. Plus, he shares details on his battle with prostate cancer. We can't believe he kept this a secret! Dr. Drew Pinsky has such an amazing story to tell and we're so happy he's sharing his knowledge with the world. 24 September 2013 12:48 PM, PDT | E! Online | See recent E! Online news » Dr. Drew has spent years listening to other peoples' health problems. 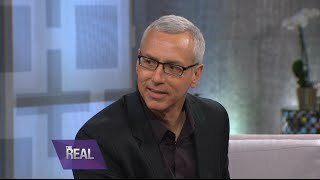 Prostate Cancer Survivor Dr. Drew seeks advice of his own to get through prostate cancer. In the fall of 2011, Dr. Drew Pinsky’s life was just where he wanted it.